My final film watched of 2015, I recorded this one off the Horror Channel a while ago, and watched it on New Year's Eve. It's a Hammer horror classic, right from their glorious hey-day, in which the Germanic village of Vandorf is troubled by the spirit of a millennia-old Gorgon who comes out when the moon is full and turns people to stone. It is also one of Christopher Lee and Peter Cushing's twenty-odd screen collaborations. I have seen it before, but a looong time ago - probably a good 20 years, I reckon. It is almost really brilliant. Much of the usual reliable production team is here - James Bernard doing the music, Bernard Robinson the sets, Michael Reed the photography, Rosemary Burrows the costumes and Terence Fisher the direction. Quite apart from Lee and Cushing, the cast is great too. Richard Pasco, Michael Goodliffe and Patrick Troughton are all worth the entrance fee alone, but Barbara Shelley particularly shines in a role which really shows her range: kind, gentle and loving, strong-willed yet afraid and internally conflicted, while always remaining entirely convincing as a single, coherent character. I already loved her from Dracula Prince of Darkness (in which she is similarly wide-ranging), Rasputin the Mad Monk and Quatermass and the Pit, but she really excelled herself in this one, and I'm now thinking I should make a point of seeking out some of her other appearances. What lets it down, though, is a story-line which doesn't fully work through its potential. There's a good idea on the table. The Gorgon operates by possessing Shelley's character, a nurse named Carla. Carla isn't consciously aware of what happens to her during the full moon, but it is obviously bothering her at a subconscious level. So, from an early stage, she is unhappy with the way everyone else in the village is trying to cover up the regular unexplained deaths in the area, and yet is also clearly afraid of finding out the truth, especially as she gets closer and closer to discovering that the real monster is in fact herself. Meanwhile, two men are in love with her: Cushing, playing a doctor who is also her employer, who on one level tries to protect her from the truth, but on another uses it as an excuse to control her to an abusive extent, and Pasco, playing a man already bereaved twice by the Gorgon, who genuinely loves her and wants to rescue her, but of course does not realise that she is already the cause of his grief. Carla returns the latter's love, but cannot run away with him because she is unbreakably tied to the village by the monster inside her. There is huge potential there. At an unconscious level, Shelley's character possesses the power to literally stop Cushing dead and free herself from him. Yet the very same power also means that if she so much as looks at the man she truly loves in her possessed state, she will kill him. That could have been played as a powerful tragedy; an inescapable dilemma; an exploration of the impossible ties and constraints which women have to negotiate - and Hammer was capable of delivering stories like that, as I think the domestic abuse plot in Taste the Blood of Dracula shows. Here, is it nearly the driving heart of the story - nearly enough to be identifiable within it. But it isn't developed anything like strongly enough. The development of Carla's relationship with Pasco's character is rushed and unconvincing, and although we see Carla's fear and conflict very clearly indeed when Shelley is playing her, that should be matched by a sense that even in her Gorgonised state she is fighting for control over her inner monster. But there is nothing of the sort at work, most obviously of all because the Gorgon when we see it is not actually played by Shelley, but by another actress named Prudence Hyman in pretty dreadful make-up and a rather worse snaky wig. All of Shelley's hard work in building up the character is just lost that way; and there isn't enough screen time or dialogue to explore any of it anyway. The screenwriter responsible, John Gilling, did quite a lot of scripts for Hammer, but I note that they tend to be adventure stories, rather than the Gothic fantasies I prefer, so perhaps I should aim to steer clear of his few other forays into this genre. I am also going to come right out and say that I don't think Christopher Lee is particularly good in this film either. His character is actually the good guy, who arrives half-way through the story, applies an open-minded rationalism to what is going on, figures out what the villagers are hiding and eventually dispatches the Gorgon. And this is something he is definitely perfectly capable of doing well, as his performance as the Duc de Richleau in The Devil Rides Out shows. But for some reason he evidently decided to give his character in this film a sort of brusque gruffness which just didn't work for me. This isn't to say he's abysmal. He has some good confrontation scenes with Peter Cushing, where there is a lot going on emotionally on both sides of the equation. But of the two, Cushing's depiction of a man who, while rather unlikable overall, elicits our sympathy through the obvious mental anguish caused by his attempts to cover up Clara / the Gorgon's crimes, is distinctly more compelling and interesting to watch. Finally, what can we make of the use of a Greek mythological creature in this film? It's only to be expected, really. Hammer in this period were clearly working their way through every monster they could think of in their search for suitable new material, and they were bound to turn to Greek mythology at some point. It also happens to make the middle entry in a nice trio with The Mummy (1959) and The Viking Queen (1967): Egypt ✓, Greece ✓, Rome ✓ - and I think there is clear hierarchy of priorities at work in the order they went about them, basically working from the culture with the most potential for macabre fantasy stories to the one with the least. The particular choice of a Gorgon I would guess probably springs from a fairly simple pragmatic equation - she is female, so (in her non-Gorgonised state) can be a beautiful woman, thus delivering the famous Hammer Glamour, and her only non-humanoid attribute is the snakes, making the special effects relatively manageable too. 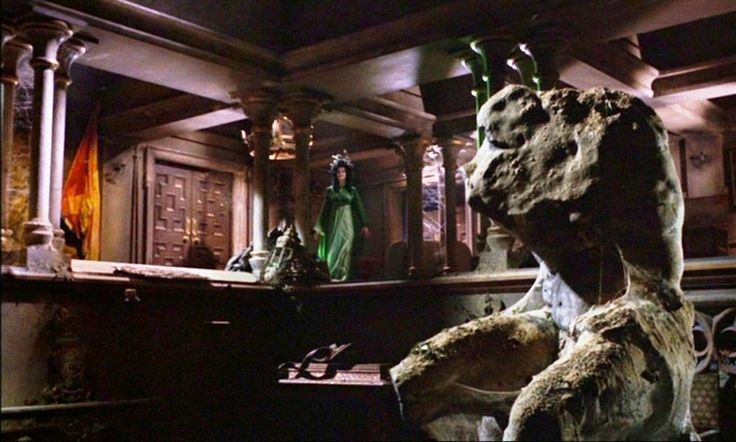 (This film pre-dates Clash of the Titans (1981), so its Gorgon does not have a snaky tail - Ray Harryhausen invented that.) The effects are still pretty poor, and this is a major flaw in the film - but imagine how much more trouble they would have had trying to do the sphinx, harpies, Echidna or similar. On one level, this was a reasonably obvious creative touch for a film about people being turned to stone by a monster from Greek mythology. And the particular choice of the Belvedere Torso is not difficult to explain. It's an extremely famous piece of Greek sculpture (technically a Roman copy of a Hellenistic original, but that is true of most surviving 'Greek' art), of the type which you would come across pretty quickly if you picked up any book on the topic. But then again, there would have been lots of other options in the same book too, and homing in on one which expresses anguish and tragedy so eloquently through its twisted pose and fragmentary state deserves credit; as does the fact that its missing limbs and head both resonate rather nicely with what happens to some of the Gorgon's victims, and eventually also the Gorgon herself, over the course of the film. Possibly the Laocoön, with its snaky theme, would have been an even better choice - but then again I see why a replica of that statue would be considerably more time-consuming and expensive to make. Also, it left the stage clear for 28 Days Later to use the Laocoön statue in a very similar way many decades later - maybe even inspired by Bernard Robinson's set designs, who knows? Overall, worth watching for Barbara Shelley, the Lee-Cushing pairing and the general Hammery goodness, but not in the first rank. Cushing better than Lee in this film, I really must rewatch it properly, I half watched it when it was broadcast but was too distracted to pay it proper attention at the time. I think I love him best as Viktor in the Curse of Frankenstein...v closely followed by his first two outings as Van Helsing and of course his blistering performance as the Reverend Blyss in Captain Clegg - he looks utterly delicious as a clergyman. He is definitely quite Viktor-ish in this one.